Attendees at IQPC’s Call Center Week conference explored a wide range of topics, from cloud contact center platforms to workforce management. But, there were two themes that clearly echoed throughout the conference expo and hallways that not only signal two key trends in customer support – they’re also closely linked with one another. Without question, many of the contact center leaders we spoke with wanted to learn more about omnichannel customer support along with the steps they can take to begin expanding channel support to their customer bases. Indeed, the customer landscape is shifting as customer contact patterns are cutting across multiple channels. One of the top challenges many companies face is customer experience breakdowns that occur as a customer transitions from one channel (e.g. chat) to another (voice). This helps explain why 57 percent of all calls into the contact center now come from customers who tried – but failed – to resolve their problems on a company’s website, according to Forrester Research. 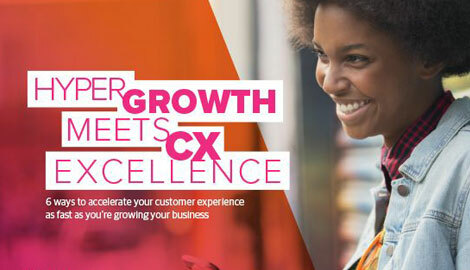 Despite these challenges, the emergence of the omnichannel/cross-channel customer represents a huge opportunity for the contact center to transform from a cost center to a superior experience creator. This is where the use of predictive analytics can truly heighten the omnichannel customer experience. A big part of the omnichannel transformation includes a growing willingness among customers to self serve. To help ensure that a company is delivering the type of intelligent self-service experience its customers expect, predictive analytics can be used to determine the responses to customer queries that customers would find most useful. This is just one example as to how predictive analytics can be applied to the omnichannel contact center. The use of unstructured data from customer calls and social media sentiment that’s shared about a brand can help inform organizational leaders about the nature of a customer’s complaint. Real-time predictive analytics can then automatically alert an associate or contact center supervisor with the next best action that should be taken to satisfy that customer. For instance, let’s say a high-value banking customer incurs a check overdraft fee and posts a negative comment about this on Facebook. Predictive analytics can determine that this high value customer is now at risk and the next best action is for an associate to do an outbound call to waive the check overdraft fee for the customer. While the bank may lose $35 in the short term, it will more than likely extend the value of that customer’s business over the long term. Analytics can also be used to help companies segment their customers. This can be particularly useful for onboarding customers and to determine the types of product or service issues they’re most likely to reach out to a company with in, say, the first 60 days. Identifying these issues, and then taking proactive steps to connect with a customer in the channel of their choice (e.g. offering a customer links to video tutorials to guide them through product implementation), can strengthen the customer experience while deflecting calls to the contact center. As customer experience leaders look to improve business and operational performance, predictive analytics can also help get to the root cause as to the drivers behind changes in performance metrics. This can include determining why Net Promoter Score™ (NPS®) rose 15 points over the past month for a telecom company and ensure that any process or operational changes that fueled this uptick are continued. In order to provide the types of omnichannel support experiences customers expect, it’s critical for associates to have the most current customer data possible. This can enable them to provide relevant and contextual support. This includes data that can be drawn from CRM, omnichannel support systems, quality management, and other sources to gain a more complete picture of the customer experience. The contact center is a continuous journey in learning. Gathering, analyzing, and acting on the full volume of available customer information can enable companies and their associates to deliver the types of relevant and contextual experiences that customers expect. The contact center also represents the customer experience center of the organization. After all, the omnichannel contact center is the only part of the organization that is capable of obtaining the true voice of the customer. Like this? Subscribe to our blog here. Also, check out the most recent issue of our e-newsletter. Download our workshop presentation from the event. Net Promoter Score is a trademark of Satmetrix Systems, Inc., Bain & Company, and Fred Reichheld. NPS is a registered trademark of Satmetrix Systems, Inc., Bain & Company, and Fred Reichheld.